For hoist elevators you can rely on throughout the duration of your build, turn to none other than Sims Crane & Equipment. 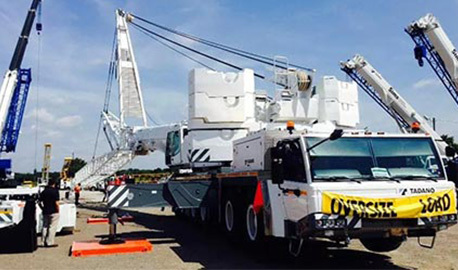 We have been serving the needs of Florida builders for 6 decades, and we are the crane company to trust with all of your industrial equipment needs and services. Hoist elevators, often referred to as material hoists, are ideal for vertically transporting materials to highly-elevated locations throughout your jobsite. Designed to safely lift hundreds, and sometimes thousands, of pounds of material several hundred feet into the air, hoists can be huge money- and time-savers by allowing your team to keep your project moving. At Sims Crane & Equipment, our hoists are built to last. We only offer the most reliable equipment to our clients, so whether you are interested in purchasing a hoist for private company use or want to rent hoists for current or upcoming projects, we have the equipment you need. Our rentals are all regularly inspected for wear and tear, so you can trust our equipment throughout the duration of your rental period, and in the unlikely event a breakdown does occur, we can quickly dispatch parts, technicians, and replacement equipment to your jobsite to decrease or eliminate down time. Hoist elevators, along with our mobile cranes, crawler cranes, tower cranes, forklifts, and other rental equipment, are available for daily, weekly, and monthly rental periods. In addition, we gladly offer Flex Time scheduling to help those with flexible timelines save even more money on their equipment rental costs. Builders and contractors can immediately spot the difference when working with our crane company. We provide value-added services you can’t find anywhere else including 3D lift planning, machinery moving, and more. Our staff is comprised of industry experts who can provide you with best-in-class recommendations for nearly any project. If you have a jobsite or upcoming project in the Space Coast and are in need of hoist elevators, cranes, or other industrial construction equipment, contact the crane company trusted by more Florida builders – Sims Crane & Equipment. We look forward to serving you!